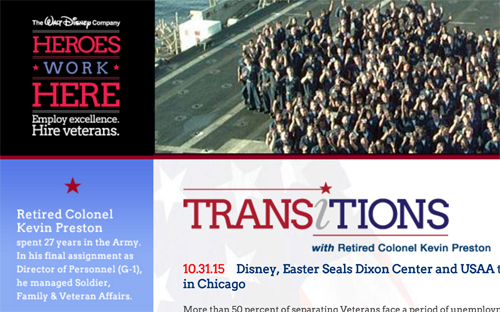 When The Walt Disney Company pledged to hire 1,000 veterans within three years, there was a need for a microsite as a one-stop shop for veterans looking for information about making the transition to the civilian workforce at Disney. 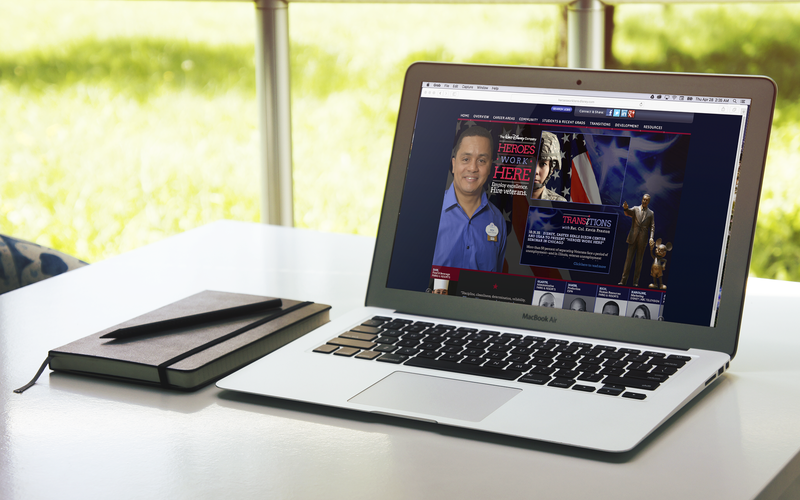 The site features a blog, videos, a job search engine that translates military job titles to their civilian equivalents and other job search resources. The microsite was the beginning of a campaign that grew to include social media, a print and television ad campaign, and three career fairs held in Burbank, New York and Orlando all led by a five-person recruitment marketing team. As the scope grew, so did the visibility of Disney's efforts with the Obama administration, which culminated in a visit by First Lady Michelle Obama to give remarks at a conference where Disney shared with other companies how to implement their own training programs for veterans. The effectiveness of the campaign led to Disney reaching its goal of 1,000 hires in less than a year instead of three and hiring more than 6,000 veterans in just two years. 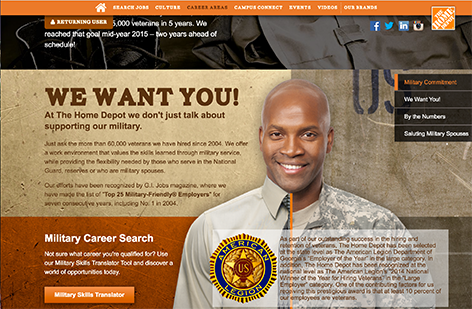 Walmart and Home Depot also launched initiatives to hire veterans. A common feature on each site was a search engine to match up veterans with jobs equivalent to their skills gained during their military experience. The sites were static and provided evergreen content. 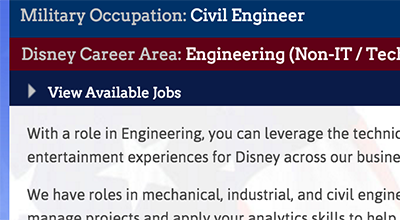 We saw this as an opportunity to differentiate Disney's microsite with a blog and video series to complement the seminars held at military bases and cities around the country. One of the challenges of matching up veterans with jobs is many military job titles don't have apparent equivalent in the civilian workforce. We worked with military HR professionals to create a search engine that would show the types of civilian jobs that would benefit from the skills a veteran would have picked up during their military career. 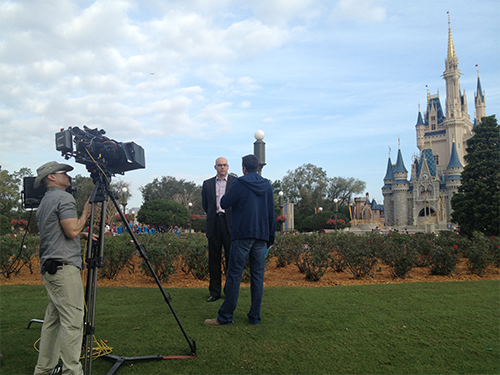 To raise public awareness of the need to support members of the military, the recruitment marketing team interviewed more than 50 employees to tell their stories of how they came to Disney. Several were chosen to appear in 30-second commercials that aired on ESPN and ABC. A series of career fairs were held in a two-week period in Burbank, New York and Orlando. Each event needed to have at least 1,000 attendees to be successful, and it fell up on the recruitment marketing team to raise awareness and get veterans to register for the conferences. Thanks to local television news stories and social media, we saw great interest in Southern California and Orlando, but the forecast for registrants in New York showed that event would reach only half capacity. After asking recruiters and military HR professionals about the reasons, we didn't find one solid answer, so we doubled our efforts with an e-mail marketing campaign after purchasing an e-mail list of veterans in the New York metro that helped us reach our goal. As part of the Disney’s Heroes Work Here program, The Walt Disney Company held its inaugural Disney Veterans Institute in 2013. The seminar featured experts from Disney, government officials, veterans, and nonprofit veterans’ service organizations, who shared best practices to companies looking to start veteran hiring programs. First Lady Michelle Obama and Walt Disney CEO Bob Iger were the keynote speakers.